This is a beautiful modern and fully furnished self-catering apartment overlooking the golf course at Rockley Golf & Country Club. Rockley is a secure, peaceful development of apartments and town houses set around the golf course in 70 acres of beautifully landscaped tropical surroundings. The apartment can sleep 2 people in an air-conditioned bedroom and there is a sofa bed in the living area suitable for small children. The fully equipped kitchen comprises an oven with electric hob, microwave, full sized fridge-freezer, toaster, coffee-maker & kettle and all necessary utensils and crockery. There are 2 private balconies, one overlooking the golf course and the other overlooking the very attractive pool area. The breezy balconies offer plenty of space for relaxing with a drink and enjoying the tranquil surroundings that Rockley offers. The apartment is situated on the upper level of a two storey building, accessed by way of a private staircase. Free laundry facilities & maid service. These are two beautiful modern and fully furnished self-catering apartments overlooking the golf course at Rockley Golf & Country Club. Rockley is a secure, peaceful development of apartments and town houses set around the golf course in 70 acres of beautifully landscaped tropical surroundings. Many of the residents at Rockley are locals, making it quieter than most tourist locations, yet within easy walking distance of all amenities that the popular south coast offers, including perfect white sandy beaches, bars/restaurants/cafes, supermarket, banks, beauty salons and duty free shops. It's a 15 min walk to the beautiful Rockley beach also known as Accra, which offers crystal clear water teeming with tropical fish, soft white sand, and water sport activities. The famous St Lawrence Gap, offering vibrant night-life and entertainment in its many bars and restaurants, is also walking distance or a short taxi ride away. Whilst car hire is not essential due to the central location & on-site taxi rank, there is ample private parking available if you choose to hire a car to explore the Island. The apartment is 15 minutes’ drive from the airport & 10-15 minutes' drive from the historic capital, Bridgetown. Golf: Rockley Golf Club is a 9 hole (18 tee) par 36 golf course, with its own professionally staffed pro shop, bar and restaurant. Golf clubs, trolleys and carts are available to hire. The Barbados Golf Club is 10-15 minutes' drive. Barbados boasts several world class golf clubs, including the world famous Sandy Lane and Royal Westmoreland, which are both within 25-30 minutes' drive from the apartment. This newly renovated modern bathroom features a large walk in shower, WC and basin. Available in communal laundry room. Free laundry facilities are adjacent to the pool area, 30 seconds' walk from the apartment. Maid service is weekly. The apartment is located on the upper level of a two storey cluster and is accessed via a private stairway. We love staying at Rockley, especially 632 Bushy Park. The 2 balconies back and front are great for sitting out with a drink or food which is quite easy to prepare as the apartment is very well equipped. The big bed and air con makes for a good nights sleep and the swimming pool which does not get too busy is a bonus especially with what looks like brand new pool furniture. What we like most of all is the gardens which are immaculately kept by the gardeners and the variety of birds and also the monkeys. Another bonus is the free laundry facilities, we would not stay anywhere else in Barbados, thanks to all. Very comfortable and quiet one bedroom. We really enjoyed our stay at the 1 bedroom apartment at Rockley Country Club. It is a beautiful, clean, spacious apartment and perfectly fit our needs for the week. It has a great location on the south coast near Accra Beach, and is also close to other nice areas like the Gap and Oistins. We would definitely recommend this property to others who are looking for something a bit more private and relaxed with the ability to cook and sit outside. This apartment is perfect for up to 4 people,a nice large living room,nicely furnished which includes a flatscreen TV and small sound system.There are ceiling fans in the living area with A/C in the bedroom.A renovated washroom with a large stand-up shower and a huge front deck as well as a smaller back deck give you lots of living space,the kitchen is well-equipped.We love the location,close to Accra beach,shopping and restaurants,steps away from the pool. 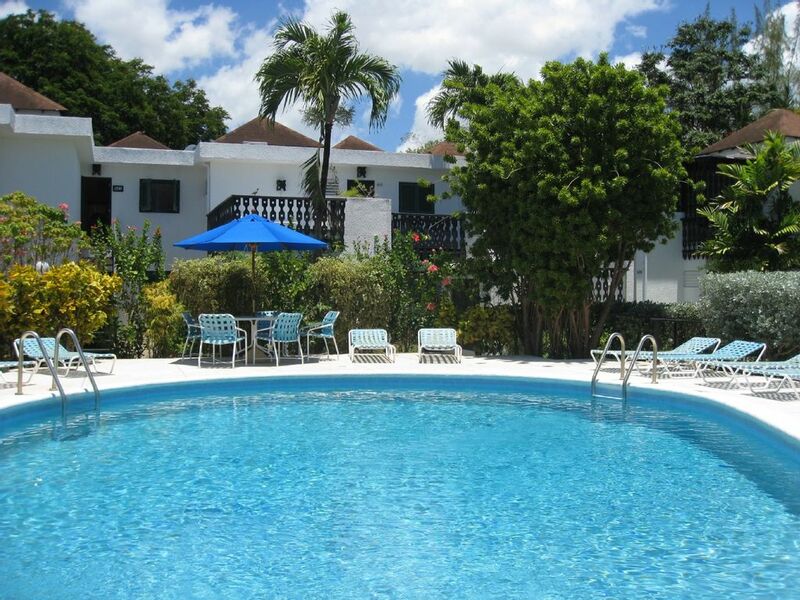 We have already booked for next year's vacation,one of the nicest apartments in the whole Rockley area! Wonderful Barbados & Bushy Park. We stayed at Bushy Park from 11th February to 1st March 2013 we enjoyed our selves so much that on our return to the UK we contacted Kirsty and we have booked for February 2014. The apartment is a home from home, very clean, nicely decorated and fully furnished to a very high standard in all rooms. The apartment has two patios one overlooking the swimming pool and the other patio overlooking the Rockley Golf Course both patios were enjoyed while having a pre dinner drink. The apartment is 5 minutes walk from a very well stocked Super Market and after completing your shopping a free shuttle bus will take you back to Bushy Park. One of many advantages of the Rockley location is that it is central to many fine beaches Accra Beach 10 minute walk away, Miami Beach and Carlisle Bay both a short bus ride away. If you are feeling energetic and the tide is out you can walk from Accra Beach to Needhams Point a fantastic walk along the coast without leaving the lovely white sand. I have no hesitation in highly recommending this apartment the location could not be better and all the staff at Rockley are so friendly and help full. This apartment is not to be missed and we are looking forward to our three weeks in 2014. Rockley Golf & Country Club is set in beautifully landscaped, lush tropical gardens. Many of the residents are locals, making it quieter than most tourist locations, yet within easy walking distance of all amenities that the popular south coast offers, including perfect white sandy beaches, bars/restaurants/cafes, supermarket, banks, beauty salons and duty free shops. It's a 15 min walk to the beautiful Rockley beach also known as Accra, which offers crystal clear water teeming with tropical fish, soft white sand, and water sport activities. The famous St Lawrence Gap, offering vibrant night-life and entertainment in its many bars and restaurants, is also walking distance or a short taxi ride away. Whilst car hire is not essential due to the central location & on-site taxi rank, there is ample private parking available if you choose to hire a car to explore the Island. The apartment is 15 minutes’ drive from the airport & 10-15 minutes' drive from the historic capital, Bridgetown.